Mills Charters Whale Watching Cruises depart daily from Hillarys at 9:00am Monday - Friday (weather and numbers dependent). All cruises are 3-4 hours in duration. Mills Charters Whale Watching Cruises depart daily from Hillarys at 9:00am Saturday and Sunday (weather and numbers dependent). All cruises are 3-4 hours in duration. Mills Charters Whale Watching Cruises depart daily from Hillarys at 1:30pm Saturday and Sunday (weather and numbers dependent). All cruises are 3-4 hours in duration. Mills Charters Whale Watching Sunset Cruises depart Hillarys at 4:30pm on Friday's (weather and numbers dependent). Watch the amazing whales with the sun setting in the back ground. Cruise the the amazing coastline of Perth & Fremantle's local waters and enjoy the amazing whales and scenery Perth Coastline has to offer with friends, family or colleagues on board one of Mills Charter's Luxury Vessels. 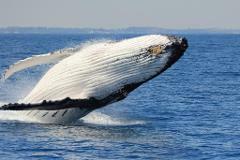 Whale Watching trips depart Hillarys at 9:00am Monday - Sunday September through to end of November. Weather dependent. Please redeem your voucher online to book in and we hope you have an amazing experience with Mills Charters. Whale Watching trips depart Hillarys Boat Harbour daily at 9:00am Monday - Sunday & also 1:30pm on Weekends. Weather dependent. Please redeem your voucher online to book in and we hope you have an amazing experience with Mills Charters. Mills Charters Whale Watching Cruises depart from Hillarys at 1:30pm Monday - Friday (weather and numbers dependent). All cruises are 3-4 hours in duration.